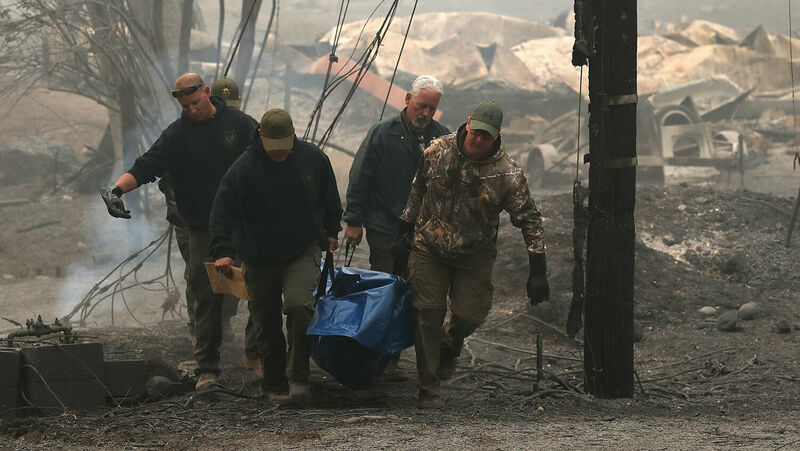 Yuba and Butte County sherriff deputies carry a body bag with a deceased victim of the Camp Fire on November 10, in Paradise, California. California receives no rest from destructive, deadly fires. The Camp Fire is hardly a campfire, and Paradise does not quite live up to its name. The town in Northern California has been almost completely burned to the ground in less than a week. Starting on November 8, the Camp Fire has scorched almost 120,000 acres in Butte County. However, it is not the size of this blaze that has attracted so much coverage and attention. Previous fires, such as the Carr Fire earlier this year, have charred more than double that area of land. What makes this fire stand out is its deadliness. The fire has killed at least 42 people, making it the deadliest fire in California’s history. The previous record was 29. The official death toll could yet rise, as hundreds of people are still missing. Most of the bodies found have not yet been identified. Of the three whose names have been released, the average age is 63. Paradise is mostly a retirement town, making it likely that the average age of victims will remain high. Beyond the Camp Fire’s deadliness, its destructiveness has also set a new record. The fire has reduced the town of Paradise to ruins, destroying over 7,000 buildings—the vast majority were homes. To put this into perspective, the previous record for destructiveness was set only 13 months ago. The Tubb Fire of October 2017 destroyed more than 5,500 structures—1,500 fewer than the Camp Fire. Fires further south are also posing grave threats. The Woolsey Fire near Los Angeles has killed two people and burned over 90,000 acres. Smaller blazes, such as the Hill, Lynn and Rocky Peak fires, have also started recently. President Donald Trump announced in a tweet on November 12 that he has approved a major disaster declaration for California, allowing the state to use federal money to fight the flames. “I just approved an expedited request for a Major Disaster Declaration for the state of California. Wanted to respond quickly in order to alleviate some of the incredible suffering going on,” the President wrote. “I am with you all the way. God Bless all of the victims and families affected” (emphasis added). What the president and many others do not realize is that God will not bless California or save the state from its fiery plight at this time. In fact, He is doing the exact opposite. California has been experiencing one disaster after another for decades. In his 2003 article “Is California Under a Curse?”, Trumpet editor in chief Gerald Flurry pointed out that California’s problems go much deeper than wildfires. Multiyear droughts, crippling debt and eruption of racial tensions in the early 1990s are just a few of the problems that California has struggled with. Out of all the states in the union, why is this state especially suffering so intensely? In an overt attack against Mr. Armstrong, the state of California, through the attorney general’s office, launched a massive lawsuit against the wcg in 1979. On January 3, that office initiated a sudden, armed assault on the Pasadena headquarters in an attempt to claim ownership of the Church’s property and assets as well as its continuing income—in violation of the U.S. Constitution. A receiver, secretly appointed by the court, tried to take over and operate God’s Church. Completely false, outrageous and baseless allegations of financial mismanagement were made—despite financial and all other required records having been regularly and voluntarily filed. No evidence of wrongdoing was ever found, and on Oct. 14, 1980, the attorney general dropped all charges and dismissed the case. Later, the higher appellate court ruled that the lawsuit was without foundation. California is the only state that ever attacked Mr. Armstrong and his work. Actually, it attacked a lot more than that. California really attacked the living God! The wcg was headquartered in Pasadena, California. While the wcg was under Mr. Armstrong’s leadership, God’s message was preached in California more than anywhere else in the world. But California rejected that message and actually attacked the Church! After Mr. Armstrong died, the very Church that he raised up rejected the truth that God had given through him. God tells the people of Israel—the modern-day nations of America and Britain—that if they obey His law and live according to His way of life He will pour out great blessings on them. On the flip side, if they reject His way of life, terrible curses will come upon them. (Read Mr. Armstrong’s free book The United States and Britain in Prophecy for proof of the modern identity of Israel.) These blessings and curses can be found in Leviticus 26 and Deuteronomy 28. Some of these blessings have to do with the weather. For example, in Leviticus 26:4-5 and Deuteronomy 28:11-12, God promises favorable weather conditions like rain in due season and productive farmland. But if the people do not follow God’s way of life, then God says that He will inflict drought and other weather-based curses (Leviticus 26:19-20; Deuteronomy 28:16-18, 24). When meting out punishment, God begins at His sanctuary (Ezekiel 9:6). The Church Mr. Armstrong founded no longer follows most of the doctrines he taught! In principle, God begins where His own sinning Church is, especially their headquarters in Pasadena. And in general, that principle applies to the state where God’s sinning headquarters is. So it is fitting that God begins the worst part of His punishing America in California. The headquarters of God’s own sinning, Laodicean Church is there. Is there a connection to what is happening in California and God’s work through Herbert W. Armstrong? The whole world must come to see that there is! California was saturated with God’s warning message more than any other state. Mr. Armstrong also warned the whole world. Now God is going to humble Israel and also all of mankind. This is a sobering message, and not one that is comfortable to hear. But there is good news that comes along with it! After the world has been humbled to the point that it recognizes God and the supremacy of His government, law and way of life, then Jesus Christ will return and restore that government to the whole Earth. That is the hope we have to look forward to if we turn to God and believe what He says in the Bible. Read Mr. Flurry’s article “Is California Under a Curse?” and our free booklet Why ‘Natural’ Disasters? to gain a more complete picture of the purpose behind the wildfires plaguing California. The time is coming when we will no longer see any “natural” weather disasters, such as wildfires—but that future will only come once the people turn away from their sinful way of life.